The parentheses indicate portions that did not pass Soviet censors for military security or propaganda reasons. We are now beginning to get first reports of what the Nazi industrialists were able to achieve during their occupation of Russia's richest steel and coal area in the Donets Basin. Preliminary reports indicate that would-be factory managers were so busy trying to get Russian labor to work that there was little time left for the production of coal or steel or anything else. In Mariupol, particularly, was the effort to establish Germany a failure. Here the Nazi military authorities turned over a big steel plant to the Krupps work. Not much of the plant was left after the Russians shifted it eastward two years ago, but there were buildings and a plant layout. The only signs of German industrial efficiency that the Red Army found when they took the city Friday was a poster put up by the Krupps management. It warned that all workers who did not report for their jobs would be sent to the company's concentration camp. People who went to this camp never came back. It is estimated that 40,000 people from the Mariupol region died in this camp. The most striking illustration of the complete German failure in the Donbass is the fact that the Nazis were forced to ship coal from Poland into one of the richest mining regions in the world. The Red Army in the past ten months of its winter and summer offensive has almost completely wiped out the gains that the German army spent two years in achieving. As the Russians drive for Kiev and the Dnieper bend, they soon will be on the same lines where they fought the Nazis in September 1941. This morning's Red Star says that Germany now appears to be seriously preparing for a war of complete exhaustion as the only way to avoid a complete rout. German engineers are building fortifications like mad along the Dnieper and Desna river districts. It's a Number One construction project, and one that must be completed within a month. It was reported several weeks ago that such fortifications were started around the Bryansk region southward along the Desna. The task of the German engineers now is to complete these fortifications in time for the Nazi troops to fall back on them and hold throughout the winter. It's an extremely bad time of the year to have to build such a defense line. In the first place, the defense experts must visualize the terrain as it will appear under snow. That means making the present pillboxes and blindages several feet higher than summer constructions. It also means that literally hundreds of thousands of mines will have to be relaid when the first snows begin to fall. On top of all this, the German quartermasters corps must prepare the beaten German armies for winter. It's a tremendous job, and one that is going to tax the famous German "thoroughness" to the limit. Front reports this morning again mention the capture of sixteen and seventeen-year-old youths among the new reserves in Nazis regiments. Sometimes they are part of what the Germans have called "army groups." An army group is a hastily reformed unit made up of the survivors of a number of regiments who have been smashed or scattered with no leadership. These "army groups" number about forty to sixty men. Sometimes they will even have a single tank or heavy gun with them. They are given separate defensive assignments, such as to hold a height or a river crossing. However, the basic construction of these hastily formed groups does not make the Germans' ersatz units particularly effective. They operate with little cooperation from their flanks. It is becoming more and more common to capture these groups intact. Red Army guns tonight are booming at the gates of Bryansk, the key city in the German defense line in Central Russia. Tonight's communiqué reveals a sensational advance into the railroad knot on the eastern bank of the Desna river just across the river from Bryansk. The communiqué announces the capture of two railroad junctions, Bryansk One and Bryansk Two. These two junctions are within sight of the main portion of the city, which is on the western bank of the river. Bryansk was first captured by the Germans in 1941. Since that time, it has been a major military objective for both the Russians and the Nazis. It is sort of the "Kansas City" of Central Russia—a combination farm distribution center and manufacturing district. The city is about the same size as Schenectady, New York, or Sioux City, Iowa, or Austin, Texas, or Pasadena, California. Six railroads branch out from Bryansk, but only two of these, leading westward from the town, are open to German military traffic, and they are under constant attack from the Russian air force. More importantly, Bryansk is the peg of the entire German defense line in Central Russia. It ranks with Leningrad in the north, Smolensk on the western front, and Kharkov in the Ukraine as a key to the line where the Germans hoped to hold this winter. It must be pointed out that the city itself is not yet in Russian hands. There still is a wide and difficult river to cross. The Germans have blown all the highway and railroad bridges across this river. There undoubtedly will be a bitter fight for a position as important as this one. The other sensational advance revealed by tonight's communiqué is in the Russian march in the direction of Kiev. Russian troops are tonight less than ten miles from Nizhyn. This puts them seventy-five miles from Kiev itself. These troops are well within the Kiev railroad network. The capture of the railroad junction of Nizhyn will mean that, on this particular right-of-way, the Russians will have no more railroad junctions on the road to Kiev. The news continues to be tremendous here in Russia. There is no sign that it will cease in the next few weeks. There is no sensational news from the Russian front today—that is, if you discount the fact that the Red Army continues its western advance on a five hundred mile front. In the south, Soviet forces pushed westward as much as eighteen miles in twenty-four hours west and southwest of Stalino yesterday. However, the going is much tougher west and south of Kharkov where the Germans the other day tried a large-scale counterattack attempting to create a salient into the Russian flank striking toward Kiev. This counterattack failed. Further north, the envelopment of Bryansk continues. Russian troops driving directly westward down the railroad into the city have fought their way within twelve miles of Bryansk. They are only some ten miles from the east bank of the Desna river where six railroads join. The city of Bryansk is on the west bank. The communiqué also mentions a new direction today. It's the Roslavl direction, lying midway between Bryansk and Smolensk. The Russians are driving a wedge between these two German defense points which, if it succeeds, will create a vital base for flanking movements northward and southward of both these cities. In the coming weeks I think you can expect much heavier fighting and stiffer German resistance all along the front. The rate of the Red Army's advance has not been slowed in the double drive for the Dnieper in the southern and central Ukraine. However, further north in the Bryansk region and in the Smolensk direction, the fighting has been exceptionally bitter. Here the battles have been staged on territory which the Nazis have built up as a winter defense line. This line has been broken in several places, such as the section southwest of Bryansk where Soviet units crossed the Desna river. We haven't heard anything from this group for the past several days. Also in the central Ukraine, Russian forces are approaching the Kiev defense zone. These defense zones are miniature Mannerheim lines extending as much as sixty miles in an arc around a vital point. The defenses consist of acres of minefields, miles of barbed wire, and trenches all built into forests and slopes and river banks and villages. Smolensk has such a defense zone. So does Bryansk. Breaking through one of these positions is a long and costly process, but it can be done and has been done in this summer offensive. The Battle for Bryansk is in its final and most difficult stages today. 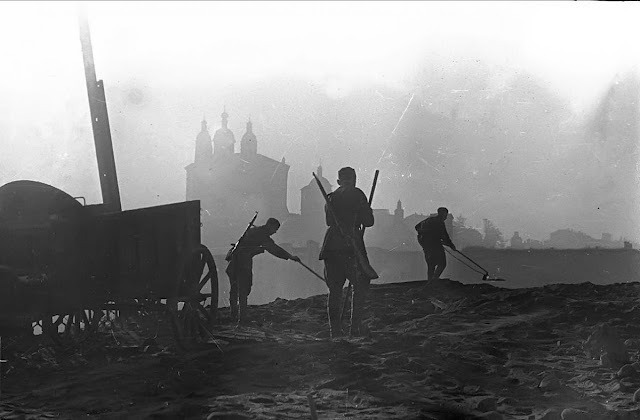 Russian artillery on the east bank of the river are lobbing shells into German positions in the city. Meanwhile the Nazis, dug into the high western bank of the river, are covering the opposite bank with a curtain of fire in an attempt to prevent the Red Army from establishing a bridgehead. Down in the Ukraine the Russians are meeting more and more German reinforcements of men and tanks. In the northern Ukraine the Germans are even trying a series of counterattacks. However, in the southern sector west of Stalino, the Nazis have not slackened their high rate of retreat—trying to hold a defensive position in the daytime and running at night. If you want a thumbnail description of the German army in Russia tonight, it can be said to be a group of men in gray-green uniforms looking for a place to stay this winter. At least this is an accurate definition of those Nazis on the upper Desna river line. The Red Army's capture of Bryansk has thrown the Germans out of the lynchpin in what was to be the link between the Nazis' northern and southern winter line. They have fallen back, alright, but the Germans have lost their military balance. They're still falling. The Bryansk victory and the routing of six Nazi infantry divisions means that a serious hole has been punched in this Desna line. Ninety miles down the river, another Russian breakthrough across the Desna is still making progress around Novgorod-Severskiy. We have yet to see how far the Russians intend to follow up on these breakthroughs, particularly this close to the fall rainy season, but the next natural defense lines behind the Desna are the upper reaches of the Dnieper river. Moscow is getting so used to victories these days that people almost think something is wrong if the siege guns and rockets don't salute another Red Army success by at least nine o'clock. There were two salutes last night—and tonight. The story goes that Moscow mothers tell their daughters, "I want you home right after the victory salute tonight." Now the daughters are answering, "You mean the first victory salute, or the second?"